Do I still think last week’s socialising was worth the effort, even after I slept until 6pm on Tuesday and was kind of out of it the rest of the week too? Yeah, probably. I just no longer feel quite so much like I beat the Fatigue Monster. I think it was letting me win, and then it came back twice as strong. I’m back at home now, having packed up all my stuff and said goodbye (for now) to my room in Cambridge. Being at home’s got some advantages, especially because I have all my books here, but it’s also quite an adjustment. Weirdly, over the weekend I seemed to get this sudden burst of energy, more than I’ve had in a long time — I made it through both days without napping, despite the effort of moving home, and last night I found myself reorganising all my bookshelves. In March they looked like this, and they’ve had several different arragements since then. This happens to a certain extent every time I come home, because I inevitably acquire books during the term, and while I leave most of my non-fiction on the shelves and only bring home what I need for the work I’ll be doing over the holiday, the fiction all needs to be given homes. Since my shelves aren’t overflowing with space, this usually means a full reorganisation as I attempt to get even better at book Tetris and somehow find gaps that didn’t previously exist — and I usually succeed, sort of. However, this time I decided I needed to do something a little bit more major. What can I say? I just really love alphabetising, you guys. 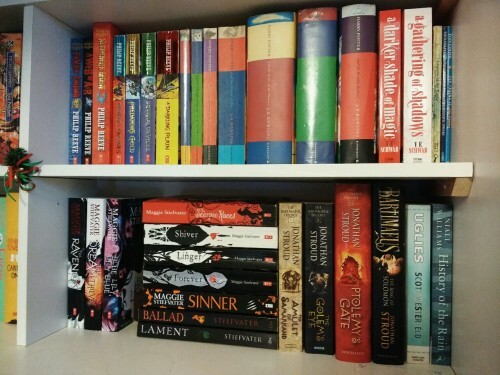 Oh, it’s got its frustrations, especially when things won’t fit, or books in a series don’t match and one of them’s too tall for the shelf, or I have to shift an entire author’s work to a different shelf because of the format (hardbacks can only go on certain shelves because of the weight, for example). But I like putting things in order, and figuring out the best way to arrange stuff, and the end result is usually two dozen shelfies and a cloud of dust that’ll have me sneezing too much to breathe for the next three days. For a long time now I’ve been alphabetising the middle shelves of my main bookshelf, but the top shelf has remained somewhat separate. Alphabetised within itself, of course, but not following on to or from the rest. It had children’s books on it, mostly, from newish paperbacks I bought myself or was given, to old Puffins that cost 3/6 and had belonged to my parents. I decided that, while I love a lot of these books, I didn’t really need them to be occupying one of my overfilled shelves. So I pulled them down and organised them into three piles. The first, and largest pile, was the books I intend to keep in my room, just not where they currently are. There’s a cupboard I’ve been meaning to clear out, and when I do that, I’ll be able to move a shelf’s worth of old schoolbooks into their for storage. That’ll give me a tall, deep shelf where I can horizontally stack quite a large number of books: perfect for these, which I’m unlikely to want to access frequently, but which I don’t want to put out of reach either. The second pile was books I wasn’t so sure about. Either I’ve read them but it was too long ago to remember any details, or I’m not sure if I’ve read them in the first place. Either way, I don’t know if I like them enough to keep them in my room. That pile is the one I intend to reread. The last, and much smaller pile, was of the books I knew I didn’t particularly want to keep. When I started it only had three books on it, two of which were old enough that the rest of the family will have to weigh in on what happens to them as they probably won’t just be thrown away but will instead end up in a box somewhere because of sentimental value. I’ve since added two more old Puffins, having reread them and decided that there was no reason why I should be the one to give them house room. Having put the rest in a box to await either the new shelf or my attention, I was able to fill the newly emptied shelf up with more recent reads, and integrate it into the alphabetised system — which now covers the whole of the white shelving unit, and the top of the brown one too. Voila. I thought about trying to explain it, then decided an annotated diagram was necessary. It took me ages to make and it’s lame, but oh well. All in all, I’m rather pleased with it, even if I’ve had to leave gaps where I hope to obtain books in the near future. (Such as the Goldenhand-sized gap in the Nix shelf.) And of course, it’s only this organised and pretty because all the ugly / weird-sized books got exiled to the Designated Ugly Shelf in the corridor, where they will live their mismatched lives. Because I admire other people’s rainbow shelves and all that, but in the end, it would never work with the books I own. Just look at those Discworld books. Where would you put those? At the very least you’d have to split them up — and would Hogfather go with the dark purplish blue books, or the orange books, or the light coloured ones? Nah. You can take my alphabetising from my cold, dead hands. Call it the librarian in me. How do you organise your shelves? Spot any of your favourites in my highly technical diagram above?